Tub Faucet. Instead of a traditional spigot, this chrome faucet fills your tub in waterfall style. Five piece set includes hand-held shower with 5 foot hose. 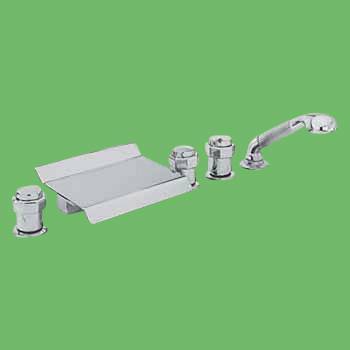 Waterfall spout 8 1/8 in. wide x 1 5/8 in. high and a 6 1/4 in. projection. 11 GPM for valves and spout.